Jenna's Giveaways and Reviews: Customized Platter from Simply Stella Giveaway! Customized Platter from Simply Stella Giveaway! I think you are going to love this next giveaway!! How would YOU like to win a platter from Simply Stella? She has SO many cute designs on her site to choose from! And while you're over there check out the birthday plates and special Easter plates as well! Want to order something NOW? How about a 10% discount code to Simply Stella? Use the code simplystella10 for 10% off your order, now through April 15! For one entry, visit Simply Stella's Etsy Site and tell me what your favorite item is. Be sure to leave me your email address and your total number of entries earned! For another entry, tweet, blog or facebook about this giveaway. Please link to my main blog page (not this page) and if you tweet, mention @Jenna05 so I see it! For an additional entry, become a follower of my main blog, or add my main blog to your blogroll! Love the little blue and orange football player! It would a great for my little boy who is a big Auburn fan! Love the pink madras plate!!!! SO cute! I'm a follower of your main blog! My daughter would love the blond ballerina! I LOVE the monkey plate!! 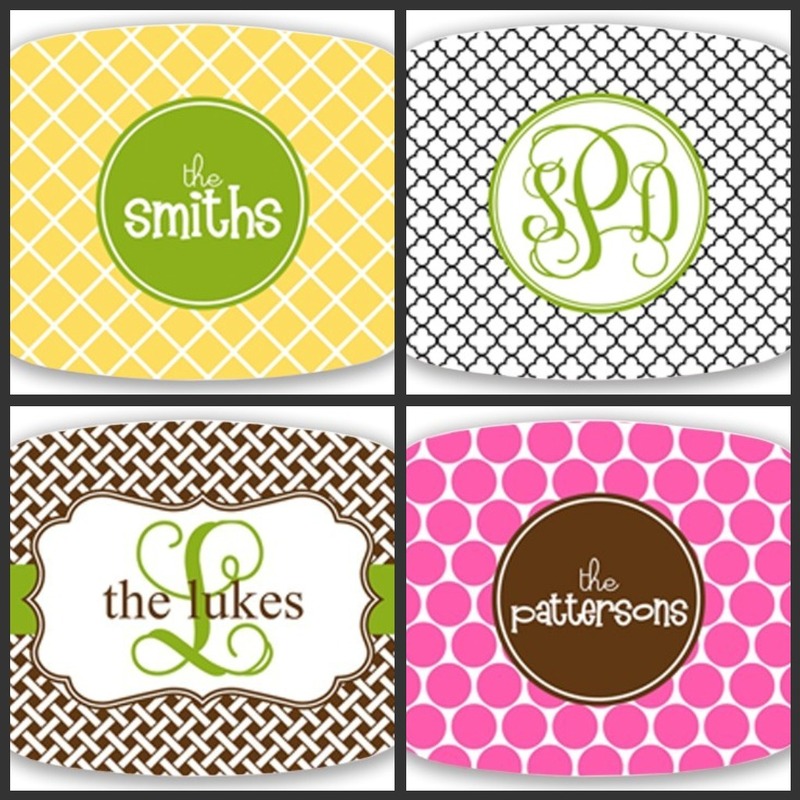 i love the family platter (Personalized Melamine Platter in yellow and green) so so cute!!!! I will be ordering Hudson a plate too! I love the Personalized Melamine Plate (Auburn Tiger Polka Dot). So cute! I love the Damask platter. Too Cute! I also follow you and you're on my blogroll! I love the yellow and green family platter! Pick me! I love the platter with the bold striped and monogram with last name written across it. I love the platter in polka dots (the bright blue and yellow combo). I would get it monogrammed with my initials and it would be perfect to take with me while tailgating or church potlucks! So hard to choose! But, I love the quatrefoil monogram platter! Would be great to take treats to play group on! I would love to have the lattice platter. I am a follower of your main blog. I like the black and green personalized melamine platter. Also, I just became a follower of your main blog. Thanks! I love the black and green striped platter with monogram and last name written across it! I follow your blog,and just love it! :)LOVE these plates/platters! I would love to have the "lattice" platter! So cute! I would LOVE the Pink and Green Platter! I love the Who Dat platter. I follow your main blog. also love the family black and green plate it is fantastic!! 1-I like all the platter-size creations at the etsy shop! 2-I tweeted the giveaway, but since I don't follow you on twitter, it may not show up on your twitter. Did ref @jenna05, though. 3-I FBed the giveaway, too. 4-I follow your main blog. Thanks so much for the great giveaway opportunity! I love the Custom Personalized Melamine Platter (Lattice)! There are so many cute choices! I love the black and white stripe platter with the green monogram! So fun! I love etsy..and Stella's site! 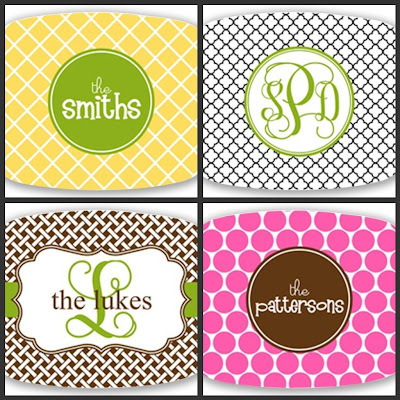 :) My favorite is the Personalized Melamine Platter-Black and Green with monogram!! I follow your main blog and you are on my blog roll! I love the lattice platter! We LOVE melamine plates at our house and that's pretty much all that my girls eat off of. they are all so precious! I'm a follower of your blog too! I like the damask monogram platter, or a cute lil boy plate for my lil boy! I love the Personalized Melamine Platter-Black and Green. I love the Lattice platter! So cute! & your already on my blog roll! I love the black and green melamine platter! I'm a follower of the main blog. I LOVE all of the items! If I have to choose one fave... It would be the black and green (striped) platter. SO cute! I subscribe to your main blog! Since she doesn't have the backhoe listed on her site now, I'd have to go with the crane plate for my son Kaiser! He is a lover of ALL things construction truck! For a second entry I am a blog follower also. I tweeted and facebooked about this giveaway. I follow your blog. Love all the pictures of your boys! My favorite platter is the lattice platter. I think it would be a great Mother's day gift for my Mom! The demask monogram would be pretty with red in the letters! Love the Personalized Melamine Platter-Black and Green! All the plates are super cute! I LOVE the Personalized Melamine Platter-Black and Green....it's all so cute! I now follow your blog too. I love these! I would have a hard time choosing between the owl and dragonfly for Adalyn. So cute!!! I love the birthday plate. Next month is my daughter's birthday and it would be perfect! I LOVE the lattice platter...cute pattern and great colors! I love, love, LOVE those precious personalized plates!! Thanks so much for the chance to win! LOVE THE MELAMINE PLATTER, SO FUN! I love the Personalized Melamine Platter-Quatrafoil Monogram! I ma head over heels for the Pink Polka Dot Lady Bug plate! So cute!! I love the family platters!! I love the melamine platter in lattice. Soooo cute! I love the damask platter-so cute! 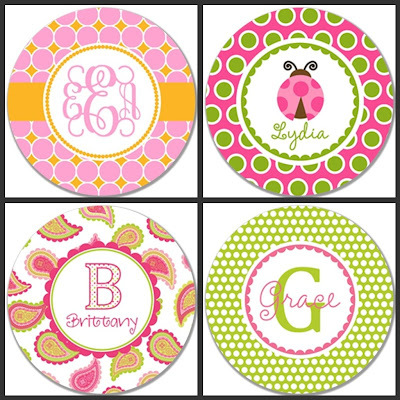 I LOVE the personalized 10' melamine plate with pink polka dots and green gator. Too cute!!!! I love the lattice platter. Super cute! I love everything but I love the family platters!! I would probably pick the Paisley Power plate because it matches Macey's diaper bag! I tweeted and I'm already a follower and have you on my blogroll! So this should make a total of 3 entries for me! i love the brown and green platter that looks like lattice! everything on there is so cute! My favorite is the brown and green lattice that says "Lukes". LOVE it!!!! Hoping to win! I love any of them but I like the yellow/green Personalized Melamine Platter. I love the Quatrafoil monogram Personalized Melamine Platter! So cute! I am a follower of your blog too! I love the Multicolored Owl Plate! I love the Custom Personalized Melamine Platter (Lattice). I love the lattice melamine platter! My daughter would love the ballerina and my son the football plate! Too cute! I am a new follower to your blog too! I LOVE the green and black family name platter! Lots of cute stuff! I love the black and green Personalized Melamine Platter! Love you blog, and enjoy keeping tabs on your B boys. Not only am I commenting but I have you on my normal blogroll. I adore the blue herringbone platter. Oh my goodness. Love the navy and pink platter, but honestly, they are all so adorable! I am a follower of your main blog and you're on my blog roll. I love the navy and pink melamine platter! So cute!! Great giveaway-- I have 3 entries!!!!! 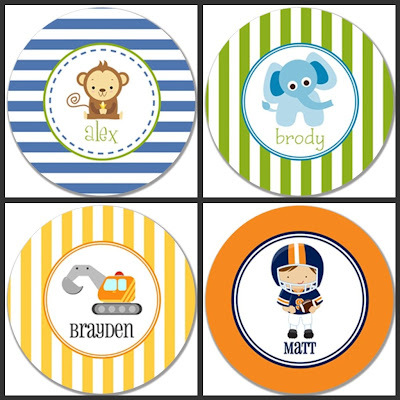 I checked out the site and love the "Personalized Monkey, 10" Melamine Plate"
I love the orange/blue football player plate, and also the brown and green platter! The family platter is so cute! Great website!! You know I'm a follower!!!! I would pick polka dotted plates for the twins and/or a Chevron platter! They are all so cute! I love the Personalized Melamine Plate-monkey plate:) So cute!!!! These are adorable thanks for sharing! It is hard to pick just one! I love the Personalized Melamine Platter-Damask Monogram. These are great, thanks for sharing!! I am a follower of your main blog, and you're on my blog roll! I definitely LOVE the herringbone platter! Hope I win! 1- I love the happy birthday plate and the dragonfly plate.